We Are In Solidarity With Our Women Companions - Bundesverband der Migrantinnen in Deutschland e.V. 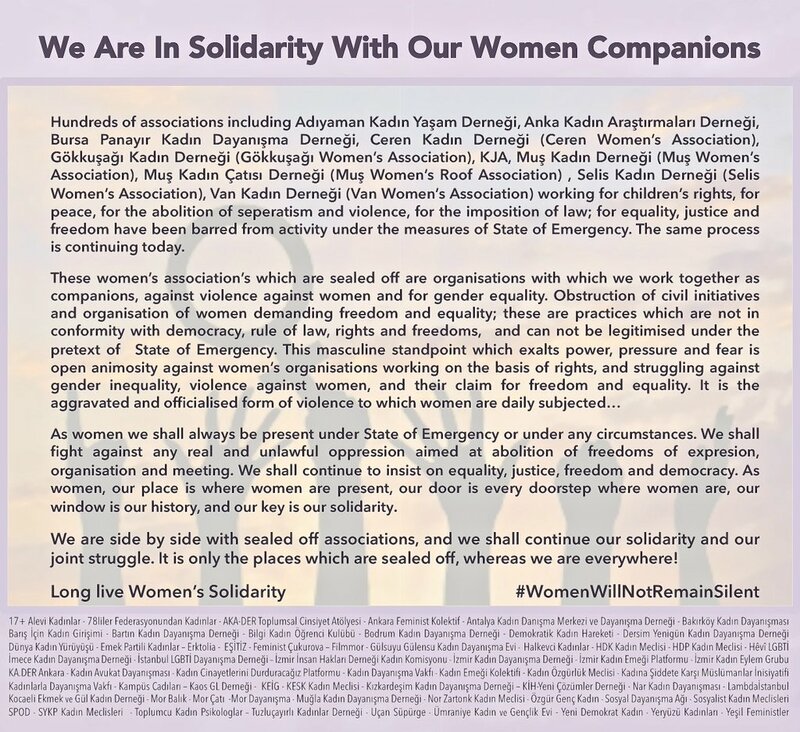 Hundreds of associations including Adıyaman Kadın Yaşam Derneği, Anka Kadın Araştırmaları Derneği, Bursa Panayır Kadın Dayanışma Derneği, Ceren Kadın Derneği (Ceren Women’s Association), Gökkuşağı Kadın Derneği (Gökkuşağı Women’s Association), KJA, Muş Kadın Derneği (Muş Women’s Association), Muş Kadın Çatısı Derneği (Muş Women’s Roof Association), Selis Kadın Derneği (Selis Women’s Association), Van Kadın Derneği (Van Women’s Association) working for children’s rights, for peace, for the abolition of seperatism and violence, for the imposition of law; for equality, justice and freedom have been barred from activity under the measures of State of Emergency. The same process is continuing today. As women we shall always be present under State of Emergency or under any circumstances. We shall fight against any real and unlawful oppression aimed at abolition of freedoms of expresion, organisation and meeting. We shall continue to insist on equality, justice, freedom and democracy. As women, our place is where women are present, our door is every doorstep where women are, our window is our history, and our key is our solidarity. We are side by side with sealed off associations, and we shall continue our solidarity and our joint struggle. It is only the places which are sealed off, whereas we are everywhere!